Packed with tender meat and abundance of fat along the jawbones, salmon heads are prized for stock and soup. They are also rich in vitamin A, Omega-3 fats, iron, zinc, and calcium. I was apprehensive about making salmon head fish stock. I had experience with chicken, beef, and lamb stock but not fish! The idea had me wondering if the whole house would smell ‘fishy’ and deter my family from trying it out. Mentally, I knew about the benefits of drinking this ‘liquid of gold’. I knew that salmon head fish stock strengthens bones and joints. I knew it could help reverse tooth decay and that it is one of the best anti-inflammatory foods. I also knew fish stock can help heal the thyroid, the eyes, and even the gut lining. What really convinced me though was knowing that salmon head fish stock is a traditional food (been around for centuries) and is revered in many parts of the world. As most of my readers know, I am a sucker for traditional foods like milk kefir, fermented cod liver oil, unsalted cultured vegetables, bone marrow, and animal organs (i.e. kidneys, liver, heart). These are the foods I give my attention to and talk about often. These are the foods that I bring into my kitchen in hopes of making them normal so that one day my own kids will give them to their kids; my grandchildren. Remove the gills with a pair of kitchen shears…the gills are attached to the head on each end. You want to cut them at the joint where they attach and discard. If you skip this part, the gills will give stock a bad color and off-taste. If you buy heads from fish counter, have them remove the gills for you. Place them in a soup pot with enough water to cover heads by at least 1-inch. Add 2-4 garlic cloves (peeled), 2 bay leaves, and 1-2 Tbs. of thinly sliced ginger. Bring to simmer and reduce heat to low. Simmer 30-45 minutes – should only bubble slightly. Skim off any foam that may rise to the top. Strain through a couple layers of cheesecloth. Pick the meat and soft tissue off bones, anything soft is edible, including eyes and brains. Return meat and tissue to the stock. Store in fridge for up to 5 days or freeze properly for several months. Add sauteed onions, garlic, leeks, cabbage, or lemon at any point while fish heads are cooking. Substitute fish stock for the vegetable stock in my favorite fish chowder recipe. Many people are squeamish about fish eyes; there is no need to be as they will dissolve into the stock. The fatty tissue around the eyes is actually one of the richest sources of vitamin A in an animal’s body. The head is the healthiest part of the fish to eat, but you can also add in the spine and other bones. Salmon heads give stock a strong flavor; if you want a milder flavor try halibut, bass, cod, or another white fish. You can use one type of fish or a combination of different types. Make sure not to cook fish stock for more than an hour as it becomes bitter. Looking for other ways to use fish in soup? Try this recipe for Creamy Salmon Soup or Fish Chowder. This is a friendly recipe for those on The Body Ecology Diet; a protocol for gut healing and overcoming Candida. If you have leaky gut, Crohn’s, autism, ADHD, or suffer from seizures or tics then you may want to avoid long-cooked broths and stick to short-cooked stocks like this one. This is because free glutamates (MSG, glutamine, glutamic acid) increase the longer the bones cook and this can be bothersome. Hard time sourcing fish heads? You can buy them online here or special order from these guys. Let us know if you find another good source. This recipe is from Cure Tooth Decay by Ramiel Nagel who claims best stock for bone/tooth decay reversal is made from carcass, heads, and organs of wild fish. 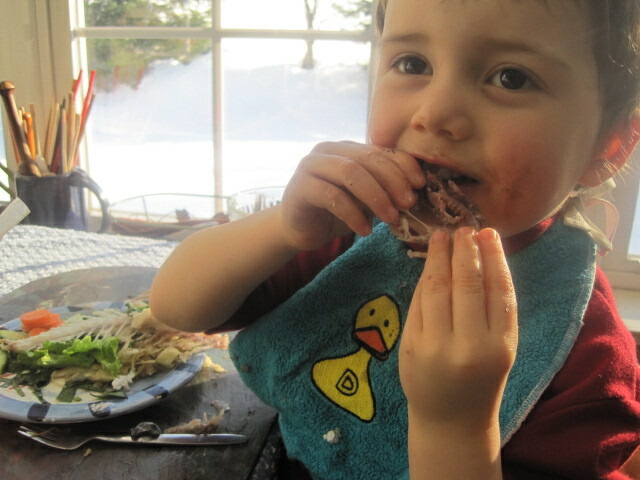 My son eating a salmon head, age 2. This blog post may contain affiliate links. Read here.